Already over 100 years ago, attempts were made to permanently remove fat, although with very modest results. Fat deposits were removed by making large cuts to the skin that obviously caused large scars. This frequently led to massive infections and bleeding. In 1921, the French surgeon Durjarrier conducted a “defatting” from the well padded inner knees and calves of a ballerina. The result was a disaster, resulting in the subsequent amputation of her leg. 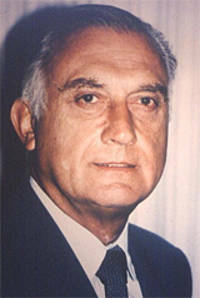 The first advances in the so-called fat removal operation came from the Brazilian surgeon Pitanguy in 1964. However, even with his techniques, long and visible scars remained. 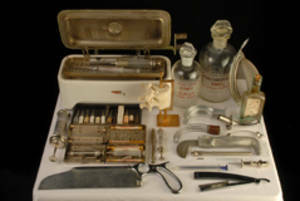 At the beginning of the 1960’s, the German surgeon Schrudde proposed “lipo-exeresis”. He removed fat through small incisions with a specialized curette. High blood loss, infections and hanging skin lappets were still a problem. Finally, in 1975 the Italian surgeons Arpad and Giorgio Fischer had the idea of simply suctioning off fat. They developed a motorized suction cannula with a rotating blade directly under the cannula opening. However, the operation results were unsatisfactory: complications such as bleeding, bumps, and water retention in the wound were described. The real breakthrough came from the French doctor Illouz. He combined the suction device with blunter, finer cannules in order to remove fat. But complications such as high blood loss still meant that fat suctioning was risky. Fournier, another French surgeon, can be called the real pioneer of liposuction. He observed that a saline solution introduced into the tissue prior to liposuction greatly eased the suction process. In 1985, Fournier switched from a mechanical extraction method to a manual method, whereby reduced pressure is created in a syringe, and the fat is suctioned through a superimposed cannula. Fournier improved the technique by using thinner cannulas and a more subtle suctioning method, the so-called Criss-Cross technique (fan-shaped siphoning). Thus, he enabled more targeted and individualized modeling. It was only in1985 when the American dermatologist Klein significantly increased the dose of the anesthetic (lidocaine) recommended by Fournier and the amount of the vaso-constrictive drug (adrenaline) present in the saline solution, that the liposuction procedure became popular world-wide. The tumescent technique for liposuction was established the world over. The ultrasound liposuction method was introduced in 1998. The ultrasound principle is based on the use of ultrasound to homogenize the fat to be suctioned. The cannulae are connected to an ultrasound generator, in order to burst the fat cells. However, this method soon revealed several key disadvantages: relatively large cannulae are required, there is an increased rate of wound water retention, and bruising. Because ultrasound energy produces heat, the temperature of the tissue is elevated. For this reason, there are also serious complications such as burns with mortification of the skin region or injuries to organs. The methods of high-frequency liposuction, also known as lipopulsing, or any of the laser assisted methods are to be assessed similarly to ultrasound liposuction.. Ultrasound liposuction and lipopulsing are still classified as “experimental procedures” in the US, although they have been available for several years. Vibration assisted liposuction uses cannulae that move back and forth with adjustable frequency of the syringe. The procedure can be somewhat less physically demanding for the surgeon, and may in some areas (for example, the navel region) have more radical suction “right to the corners”. There are no differences with respect to pain, bruising and length of the operation as compared to liposculpture. The awkward equipment with hoses and heavy instruments is a disadvantage. Another very important disadvantage is that even for an experienced surgeon , just as with all mechanical methods, the risk of bumps or unevenness is greater. None of these techniques enable the use of the suctioned fat for transplantation: the fat cells are destroyed by virtue of the technique, so there is no option of success for an autogenous fat transplant. The so-called water jet assisted liposuction represents a real methodological development. This method of liposuction, developed in 2003 by German surgeons (Traufig, Meyer) is based on the water jet technique - a technique that has long been known in the industry for cutting various materials and which has been used in the medical field for years, for example in liver surgery. With water jet assisted liposuction, a fan-shaped water jet gently removes the fat cells from the tissue. As part of the same action, the fluid and the removed fat particles area suctioned off. Thus, the water jet assisted liposuction represents a safe new liposuction technique. The operation is virtually pain free for the patient, the risk of bruising is minimal and the recovery time after the procedure is shortened. Because significantly less liquid anesthetic is required, the surface contour is not bloated, which allows a more precise suction with improved ability to monitor during the procedure. Also, the patient suffers less from side effects from the drugs, because of the reduced use of liquids, and after the operation there is little fluid leaking from the incisions. A critical advantage of this method is the fact that only with water jet assisted liposuction can such high quality fat be removed that it can be used for autogenous fat transfer. Overall, this method means increased safety for the surgeon and the patient – both in terms of the anticipated result and the side and after effects of the procedure. Thus, a new dimension of liposuction has been attained. The increasing number of experienced surgeons switching to this method confirms its benefits. I have used the method of syringe assisted liposculpture according to Fournier since 1993, and to date I have completed approximately 3800 operations using this technique. After careful evaluation, the other liposuction techniques using ultrasound, laser or vibration, that have been advanced in the interim, were not an option for me, due to the risks of complication I have outlined. The advantages of the water jet assisted liposuction are so convincing that after having successfully completed the appropriate training (Ueberrreiter, Berlin), I have decided to switch to this method in the course of 2010. In the meantime the technique has been established, with follow-ups published for several hundred successful surgical cases in Germany (Meyer, Taufig, Ueberreiter). 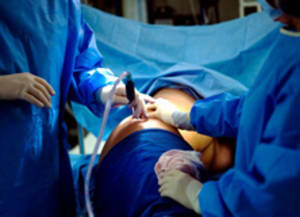 It is now imperative that informed patients are offered a liposuction method of the 21st century; a technique that is certainly associated with shorter recovery times, and as little inconvenience as possible—even if the expenditures for the required devices are relatively high (pressure generator, double-channel cannulae). With respect to the surgical technique (process, handling of the cannulae), from the point of view of the surgeon, the differences as compared to the methods I practiced previously with the manual liposculpture are not significant. I can thus apply my experience with almost 4000 liposuctions performed with the manual method since 1993 without reservations —because even a surgeon who works with water jet assisted liposuction absolutely must have the required experience in this field.